The bulbs against my neighbor's foundation are popping up. 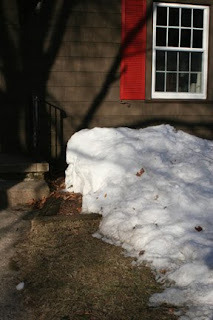 I actually saw them for the first time about a week ago, and couldn't believe it, as the snow bank you see here was taller and closer to the house, but there they were. 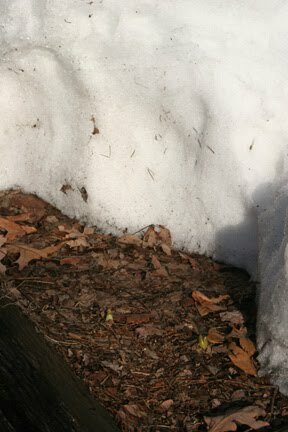 If you look closely in this shot, you can see two nubbins of hyacinths showing their brave little heads in the tiny corner of my front garden that is free of snow. This is the broad view. That snow bank has been as high as the window ledge this winter. It's been a long one for everyone, I know! I'm a cold-weather wimp, so I haven't put my nose out of my door much this winter unless I've had to. At this point I'm parched for the outdoors and my walks! This morning, even though it was 20 degrees, I said "Uncle! ", threw on my fleece-lined jeans, sweater, coat, all the stuff to keep me warm, and went to the park to walk. I was richly rewarded by the sounds of running water, song sparrows, robins, woodpeckers, and more. 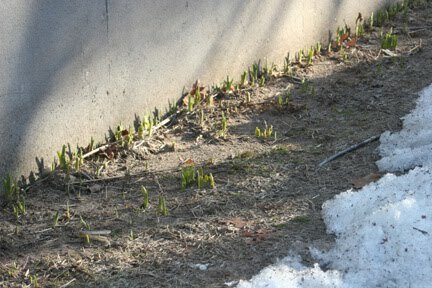 It sounds like spring, even if I had to keep my eyes peeled to avoid the black ice!